His Divine Presence Avatar Adi Da describes how sensitivity to one’s own suffering is the beginning of real ego-transcending practice. Such sensitivity moves an individual out of the usual life of effort and search, into inspection of the nature of existence and availability to Him as Divine Guru. 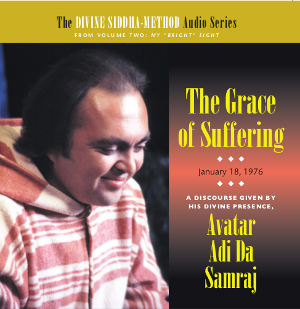 Avatar Adi Da reveals the real nature of suffering—the action of ego—and draws the individual beyond egoic suffering into the True Source-Condition. Suffering is not anything that is happening to you or has happened or will happen. Changes of state are not fundamentally to be equated with this suffering to which you have become sensitive. Your suffering is your own action. Even what you call your “self” is a form of action. The Guru . . . serves this realization in the individual, serves this sensitivity to suffering and the inspection of its nature, and serves more and more the intuition of That from Which all of this is arising.